Rice Lake Weighing Systems iQUBE2® is leading a new generation of digital junction boxes. At the forefront of iQUBE2's cutting edge design are enhanced features that will redefine expectations for traditional analog to digital technology. Rice Lake iQUBE2® is leading a new generation of digital junction boxes. 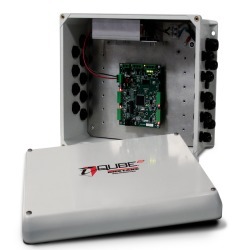 At the forefront of iQUBE2's cutting edge design are enhanced features that will redefine expectations for traditional analog to digital technology. For mission-critical applications and unmatched performance, iQUBE2 is the equipment of choice. Its high-speed ability to update up to 500 times per second on multi-channels makes it the fastest smart junction box available. Unmatched reaction time brings accuracy to new levels, increasing precision and profits. Enhanced onboard diagnostics will identify noise, test for linearity and zero reference, and monitor drift. Diagnostics are enhanced by a unique load cell emulation feature which compensates for a failing load cell until a repair can be made.